The sun was blazing and the crowd were out!! And what a reception for Upstairs at The Southern Cross…6 of our Acts performing at Fringe on the Fringe came down to join in the fun in the sun. There were icecreams, games, stalls, wonderful food and a stage for local groups to perform on! More than 5000 people came down to Fair on the Green, the wonderful annual day for residents and neighbours of Parsons Green. 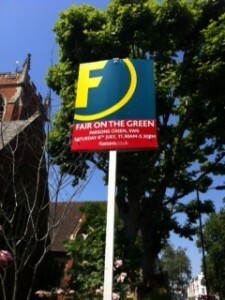 Supported and sponsored by a whole host of local estate agents and businesses Fair on the Green has become a truly magnificent annual event. This year Upstairs at the Southern Cross has opened and will now be part of this vibrant community. Watch this space for the next stage in the development of our theatre here in Parsons Green! Announcing soon the further plans for development and our Autumn season!!! Enjoy the sunshine!